When volunteer Hao Nan arrived in Sichuan on May 20, 2008 - eight days after an 8-magnitude earthquake hit the province - he quickly discovered that the truckloads of clothes he had brought with him were largely useless. Survivors in the disaster zone had enough clothes; what they desperately needed were more supplies for women and children. In the wake of that experience, Hao, a doctor at Peking University Hospital in Beijing, founded an Internet group using QQ, an online instant messaging service, dedicated exclusively to sharing information about post-earthquake aid. The group was so successful that it proved a vital source for volunteers, donators and even rescuers following the 7-magnitude tremor that devastated Qinghai province last month. After cautiously verifying his information, Hao would update his bulletin board on a daily basis. "This is a place where people can exchange information, learn of the situation in the quake zones and the most-needed materials, and co-ordinate relief endeavors," said the 28-year-old. "It has greatly enhanced the volunteer work's efficiency and made it more scientific," Hao said. 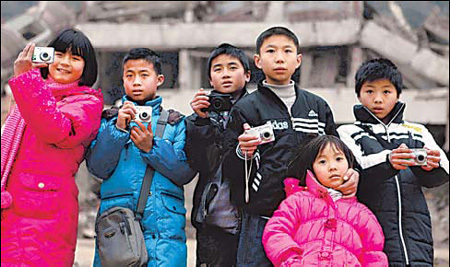 As the nation marks the second anniversary of the Sichuan tragedy on Wednesday, Hao's blend of Internet-based organization and volunteer spirit is among the many legacies of the worst disaster to hit the country in 32 years (87,150 people were left dead or missing). The State Council, the nation's cabinet, has ordered the reconstruction work - the grandest in Chinese history, say officials - to be completed by Sept 10 this year, 12 months ahead of schedule. And as most rebuilding projects in Sichuan have been completed, authorities hope the province's experience in responding to the 2008 disaster could offer useful lessons for future emergencies. 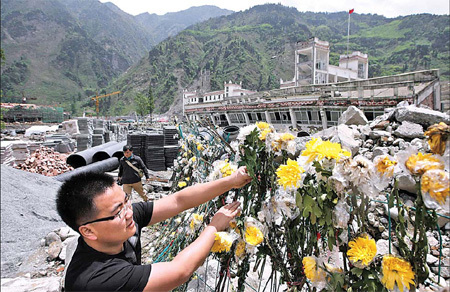 Qinghai sent a team of officials and experts to learn from Sichuan's recovery on April 16, just two days after the Yushu Tibetan autonomous prefecture was rocked by a tremor on April 14, said provincial Party secretary Qiang Wei. The first rescuers and volunteers to arrive in Qinghai, along with the first batch of relief materials and funds, came from Sichuan, its neighboring province. Post-disaster rescue and relief efforts entered a new phase of development after the 2008 earthquake, said Li Jianyou, a captain of Sichuan's emergency response unit. About 80 percent of Li's 255-member unit sent to boost rescue operations in Qinghai took part in similar efforts in Sichuan, he said. The unit only was set up last June. "There's been a systematic change in terms of awareness and equipment," said Li. "The mechanism for post-quake rescue operations is now in place as well." Aside from a swifter response from rescuers, a better grasp of technology has also enabled the government, media and ordinary citizens to interact in virtually real-time and on an unprecedented scale. It took the China International Search and Rescue team (CISAR) less than an hour after the tremor in Qinghai to publish the first micro-blog detailing its activities. In the days that followed, staff posted more than 300 updates. Cancer patient finds meaning by being mother to young quake victims.